OMG! Would you believe that A.J. and I won first place at the science fair?! I know I seemed really confident last week that we would win, but to tell you the truth, I didn't actually think it would happen. But it did! And now we're on our way to the districts! This is so super cool. Kaelin took A.J. and I out for burgers to celebrate on Friday night, which was a lot of fun. Mom and Dad both wanted to take me out too but they settled for celebrating on the weekend instead. You wouldn't believe what a crazy weekend I had. It seemed like non-stop partying - all because of a stupid volcano... Not that I'm complaining. A.J. and I figure we need to re-do some of our posters and stuff, make them more glittery and flashy if we wanna win this next competition. Man, those guys from my bio class were not happy when we won. One of the dudes even threw their project in the dumpster behind the gym! What a bunch of losers. I mean, if I had of lost, I would totally have been bummed - but there's no reason to act like a baby about it. Ok, going to go check out the American Idol polls and see whose in the lead. Have you guys voted yet? Ever Win at a Science Fair? Yeah, I win every year. I've won the science fair once. No, I've never won a science fair before. 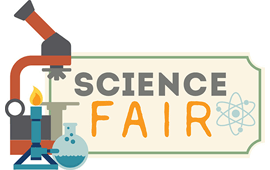 Science fair? I've never even entered before!